Points readers who have been following my attempts– in diatribes, documents, and interviews— to map out a history of feminist responses (and non-responses) to addiction will be interested in the document transcribed below. 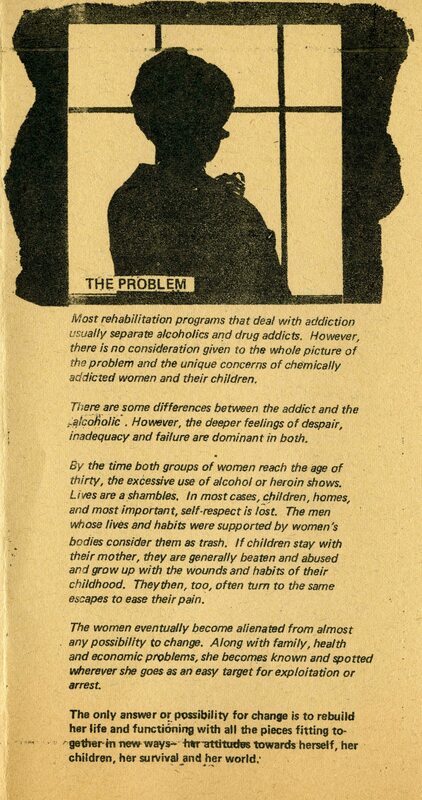 A tri-fold pamphlet from 1973 describing the work of W.O.M.A.N.– “the Women’s Organization to ‘Mash’ Alcoholism and Narcotics”–a grassroots organization located in Detroit’s Cass Corridor neighborhood, this explanation/advertisement articulates a distinct, if not a radical, feminist sensibility. It draws attention to social factors influencing female addiction, the need for woman-specific treatment that includes childcare and addresses women’s need for a sense of agency and political investment in the world, and articulates a vision of a “bottom-up” recovery program in which women addicts are co-creators, rather than passive recipients. The document comes to us from the personal collection of Terry Hluchyj, who wrote a dissertation on W.O.M.A.N. at the University of Michigan in 1982 entitled “Social Movement Strategies in Human Resource Delivery: the Dilemmas of a Community-Based Service Organization.” As the title suggests, the discussion focuses on the tensions within W.O.M.A.N. between what Hluchyj calls social movement and human services impulses/actors– tensions that played out as the organization struggled to evolve from its opportunistic and voluntaristic roots into a more professional and outcome-oriented service provider. This is one document from one program in a host of feminist organizations that I am beginning to learn about. Points readers who’ve been there/done that, take Terry Hluchyj as your model and go look out in your garage to see if you’ve got additional materials to add to this archive! W.O.M.A.N. 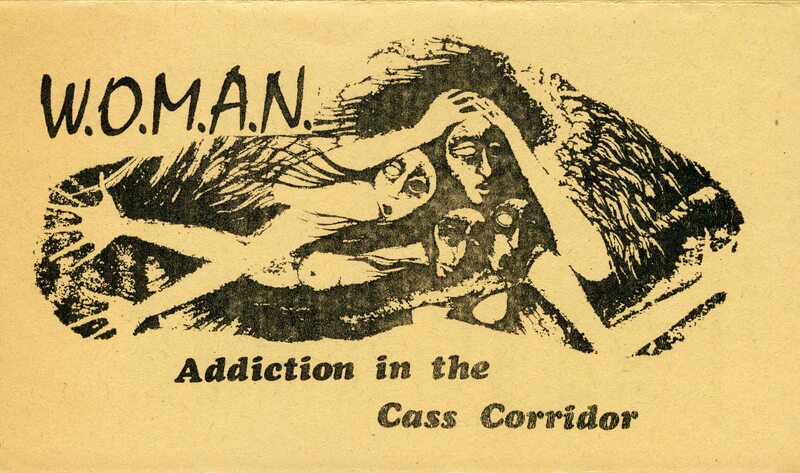 (Woman’s Organization to ‘Mash’ Alcoholism and Narcotics) is a program of the Cass Corridor in Downtown Detroit. This woman’s drug program began in March of 1971 in the Park Avenue Community Clinic. It existed for six months with volunteer staff due to the lack of funding. During that time, we learned much about ourselves the unique problems and needs of women addicted to alcohol and heroin as well as other addictive agents. We also learned how to develop a program to speak to the needs expressed. We have learned that the methods of treatment and rehabilitation of addicts must speak to the social environment that nurtures social and emotional ills. The plight of addicted women with personal-family-social problems gets little attention as they present less of an immediate threat than men who are subject to contribute to more obvious street crime. We all know that the more covert activities committed by women are as devastating to society as are the immediate crimes committed by men. WHY IN THE CASS CORRIDOR????? WHY A WOMEN’S PROGRAM????? 1. It is said that one third of all alcoholics and addicts are women. Program statistics do not reveal this percentage. 2. Only one program in Detroit specifically addresses the woman addict. She must be pregnant to enroll and then must drop out 6 weeks past the delivery of her baby. 3. The Cass Corridor has one of the highest rates of prostitution and female addiction in the city. 4. It is difficult to discuss personal problems in mixed groups of men and women. As men predominate in most programs, women tend to drop out of treatment. 5. Women have immediate concerns about rebuilding relationship [sic] with their children. Child care is an immediate problem to be dealt with in programmatic ways. 6. The Cass Corridor has the highest rate of contacts from the Women’s Division of the Police Department. Parental alcohol and drug dependency and parent-child problems go hand-in-hand. 7. Children taken into custody by private and state agencies are often children of alcohol and drug dependent parents. Most rehabilitation programs that deal with addiction usually separate alcohol and drug addicts. However, there is no consideration given to the whole picture of the problem and the unique concerns of chemically addicted women and their children. There are some differences between the addict and the alcoholic. However, the deeper feelings of despair, inadequacy and failure are dominant in both. By the time both groups of women reach the age of thirty, the excessive use of alcohol or heroin shows. Lives are a shambles. In most cases, children, homes, and most important, self-respect is lost. The men whose lives and habits were supported by women’s bodies consider them as trash. If children stay with their mother, they are generally beaten and abused and grow up with the wounds and habits of their childhood. They then, too, often turn to the same escapes to ease their pain. The women eventually become alienated from almost any possibility to change. Along with family, health and economic problems, she becomes known and spotted wherever she goes as an easy target for exploitation or arrest. The only answer or possibility for change is to rebuild her life and functioning with all the pieces fitting together in new ways—her attitudes towards herself, her children, her survival and her world. The program will address itself to basic conditions that subject women to alcohol and drug addiction. The multiple social and personal problems which affect a woman easily allow for a feeling of inferiority and degradation. Women tend to accept the socially conditioned environment of being exploited and exploiting others. Given the above conditions that renders one disabled women do not strive to realize their potential as a social and political constituent of the working class. 1. Counseling and treatment: individual and group experiences in personal and social self-awareness. 2. Vocational counseling and connecting up with educations, training, and employment where available. 3. Cultural and avocational development of skills and interests for the discovery of self satisfaction. 4. Child care programs for mothers and children to learn and grow together. 5. Program and Community Development: involvement of women in the development of this program as well as developing social concerns in programs in the surrounding community.